When I was in veterinary school a mere 30 years ago, I learned that animals do well on three legs. As my experience in practice grew, I realized that, though they can survive, they often have to live with pain and discomfort when they have lost a limb. Recently, I encountered a young Mastiff named “Pete”. He had an accident which caused the loss of a hind foot. 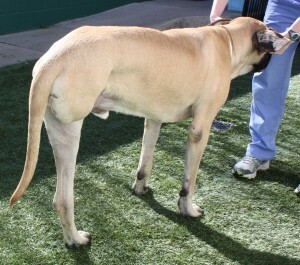 He was referred to one of our very talented local surgeons, and the recommendation was that the leg be amputated at the hip. The owner asked if there were any other option that would allow “Pete” to keep most of his leg. The surgeon told her what we (vets) have been telling people for years and years. He will either try to use the leg and injure the stump, or lick and chew on what is left of the leg. After the leg was removed and the surgery site had healed, Pete wasn’t able to walk on his three remaining legs. In human medicine, amputation at the hip because of a catastrophic ankle injury would be unthinkable. Enter Canine Rehabilitation. In the last ten years, the fastest growing area of veterinary medicine is canine rehab, which is basically physical therapy. With the development of this new area of veterinary medicine comes the idea that using mechanical appliances (orthotics and prosthetics) to help our patient’s mobility is no longer reserved for human patients alone. Orthotics are braces and Prosthetics are artificial limbs. These now offer treatment options where none existed before. I am now convinced that these items can improve my patient’s quality of life. Once a patient receives a prosthetic or orthotic, he or she works with a rehab therapist to learn how to use the device. My friend Martin was educated in human medicine and orthotics/prosthetics. A career shift brought him to veterinary medicine. As we talked, I learned how surprised he was to find that we don’t try to salvage as much of a limb as possible. In human medicine they keep as much of a limb as they can. This eventually translates into more of a limb to work with. He told me that, except for walking normally, when an animal has more of it’s leg, he can shift better in bed, use the stump to play with a ball or help him stand. With the help of people like Martin, artificial limbs are now a possibility, and I have realized that we, as veterinarians, might be selling our patients short. With the help of a rehabilitation therapist, braces or even artificial limbs can help our patients come much closer to normal activity than we have been able to provide up until now.